Chiefs linebacker Derrick Johnson is grateful to be part of Mack Brown's legacy at Texas. KANSAS CITY, Mo. — Derrick Johnson isn’t going to kick his old college coach while he’s down. Or on his way out. 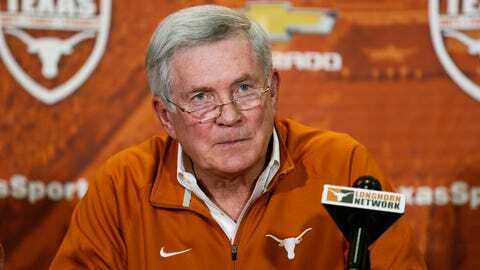 "You know, it’s a hard deal for anybody to step down from a job that’s probably the best job in college football," the Kansas City Chiefs’ linebacker said Wednesday when asked about soon-to-be-ex-Texas coach Mack Brown. "He’s done a lot at Texas." Brown announced his resignation Saturday after 16 years on the job. His career ledger in Austin is 158-47 with an Alamo Bowl yet to play, but the ‘Horns haven’t played in a BCS bowl since January 2010 and have averaged just 7.5 wins over the previous four seasons. Johnson was a lynchpin of Brown’s earlier defenses, and was a consensus All-American with the Longhorns in 2003 and 2004. During his tenure in burnt orange, UT averaged 11 victories per season and won two Big 12 South Division crowns. "(Mack is) a father figure to all the guys he’s coached," said Johnson, who recorded 458 tackles, 69 for loss, with Texas from 2001-2004. "He’s always going to be that. He’s affected a lot of people in great ways." "Oh definitely, definitely. I mean, he’s always been a father figure in my life. I’m just glad that I got a chance to (be a part of) his legacy."